"A precursor to the US Coast Guard." There were numerous private Lifesaving services along the US coast until 1871, and unlike today Lifesaving back then meant saving lives from shipwrecks, not swimmers from bathing! 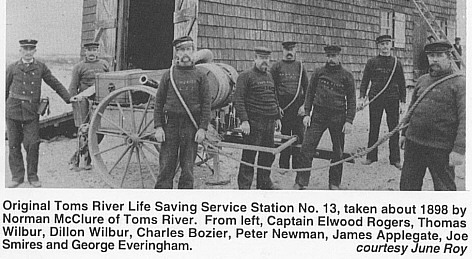 In 1871 The US government took over all of the private lifesaving stations and established the Life Saving Service. This eventually became the US Coast Guard in 1915. The Toms River Life Saving Station #13 was built in Seaside Park NJ and was so called because it was located on the barrier island due east of the entrance to Toms River (it is located at Central Avenue & DeCatur Sts in Seaside Park NJ and now serves as the boro hall for Seaside Park.) The LifeSaving Stations were needed due to the tremendous volume of shipping that went past that location on the NJ coast (between October 1 to November 1, 1878,... 1,153 sailing vessels and 135 steamers passed by the station). The station was in operation between September & April each year. The reason for the Station being located there was due to the large number of shipwrecks. In one 8 year period (April 1839 to July 1848) there were 158 vessels shipwrecked between Sandy Hook & Little Egg Harbor NJ. One shipwreck on November 30, 1896 was the Bertha Warner, a 429 ton 3 masted schooner which came ashore near K Street in present day Seaside Park NJ. According to an eyewitness, the late Bill Greger, "The crew that saved all but one man off of the Schooner was Elwood Rogers, captain, Pete Newman, Joe Smyers, Jim Applegate, George Everingham and others" . (This incident is contained in the book, Sea Side Park: Memories & Remembrances by Andrew & Gail Anderson).